Come traveler. While others pack their bag before embarking, you unpack yours, then depart. Empty, you journey. Fill yourself with the authentic, richness of a real, local experience. Savour the new flavour of foreign spices on your tongue. You learn about yourself through the world. The beautiful, flawed and human experience each hidden corner reveals. Relish the privilege. Overflow from the inspiration. Smile. Cry. Laugh. Thrill at the feeling you are both small and large in the march of history, the whirring diversity of cultures and the majesty of nature. Explore. Know your destination is only a small part of what you seek. You seek a better you. And in the finding, make a better world. 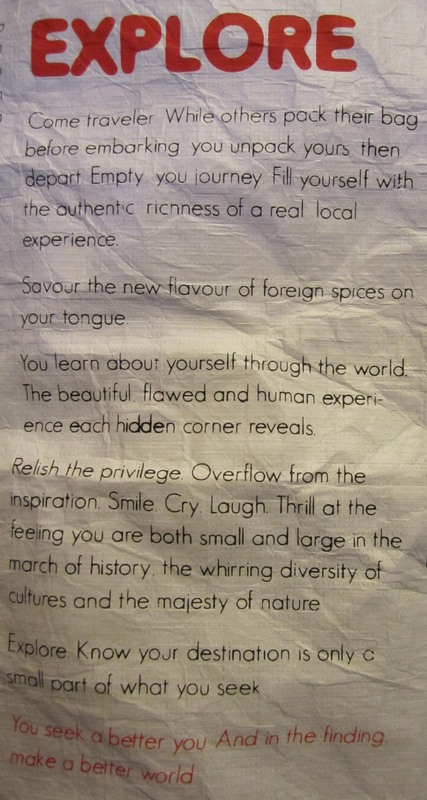 Passage written for event bags distributed at Canada Media Marketplace 2013 (photo).